Welcome to Episode #76 of the Kibbe and Finnegan show! If you’re new to the show, Mike Finnegan and I have taken our Dukes of Hazzard fandom and turned it into a full fledged automotive podcast Gong Show of sorts, completed with a full episode review from The Dukes of Hazzard. It’s every 40-year-old’s dream, right? NEW – LISTEN IN STITCHER! FOLLOW IS ON Instagram and Facebook too! You can find every episode here on The MuscleCar Place and iTunes and Google Play, and from time to time we’ll also be posting video clips and (and even) full shows to Finnegan’s Garage on YouTube. If you click the “Download” link at the top of this post you’ll be able to stream it on your phone directly. You can also pull the RSS feed as well. If you like the show…for the love of all that’s holy, share it with your buddies and tag your favorite companies on Instagram with #SponsorKibbeandFinnegan! It may be a lame, but we’re not above it. We’ll be adding in a live show stream in the future – so be sure to follow us online for notice of when that will be happening. Look for this show to publish twice monthly here (or maybe even MORE often), in iTunes, and on Finnegan’s YouTube channel! You can also sign up to win future prizes and get show notifications by visiting http://www.kfshowgiveaway.com to sign up. You’ll get a follow up e-mail that confirms you’re not a robot, and once you’ve clicked the acceptance link you’re done. That’s it! Need a generally cool shirt? Yes yes yes! Guess what? We have a new shirt…and it features an actual jumping car and everything! If you would like to support the show in a really tangible way (i.e. to buy something), please consider purchasing one. We chose the best American Apparel super-cuddly shirt as the base, and the design is a one-off by our own pal Kirk. 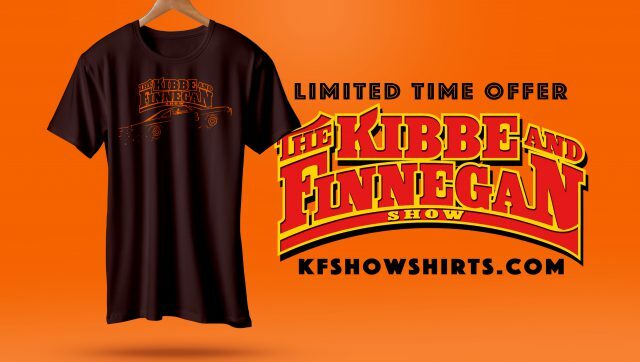 Visit KFSHOWSHIRTS.COM to pick one up! For those of you that like the witty banter more than the Dukes or Move reviews, you are in luck: this episode is all banter! Due to filming schedules, political strife, and a lack of flux in our capacitor, we were unable to get the Dukes episode thoroughly prepped for your enjoyment in time for this one (i.e. Finnegan didn’t have time to watch it yet). Don’t worry – we’ll get it on the next one. 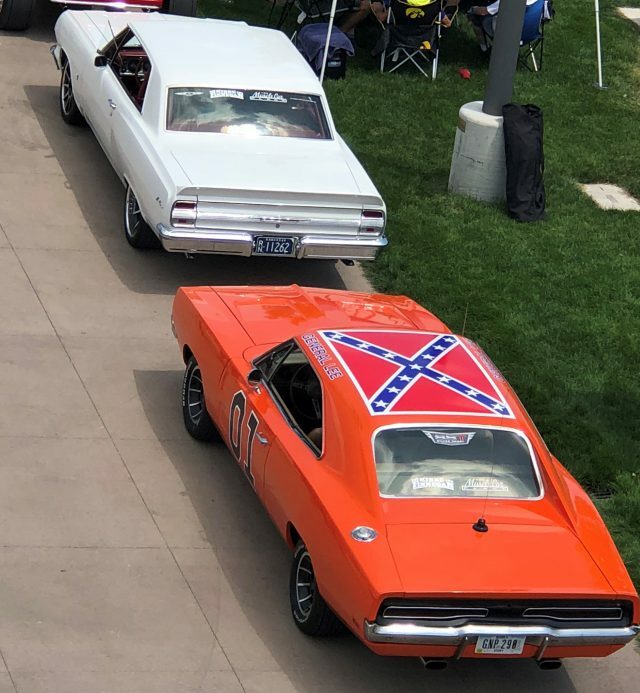 Also, for all if you who came to see me (Kibbe) at the Des Moines, IA Good Guys Heartland Nationals car show – thank you! Have a Happy 4th! As you’ll hear in this show….we’re taking a little break from running traditional ads right now. That means that right now the only support for this show is coming from you! Consider this your no-guilt-yet-kinda-begging request to take a look at contribution to our show on Patreon. We have $1, $2, and $5 monthly options available – or you can just do something of your own choosing too. 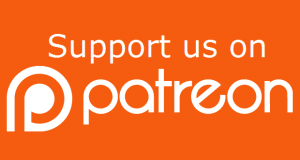 In addition to our undying love, Patreon supports will receive an exclusive once-per-month Q&A show with us – no holds barred! Our first one came out the last week of May 2018. Just click the link or picture below to get started. Thanks!! Coca Cola Corporation take note. This is how awesome sponsoring our show would be. 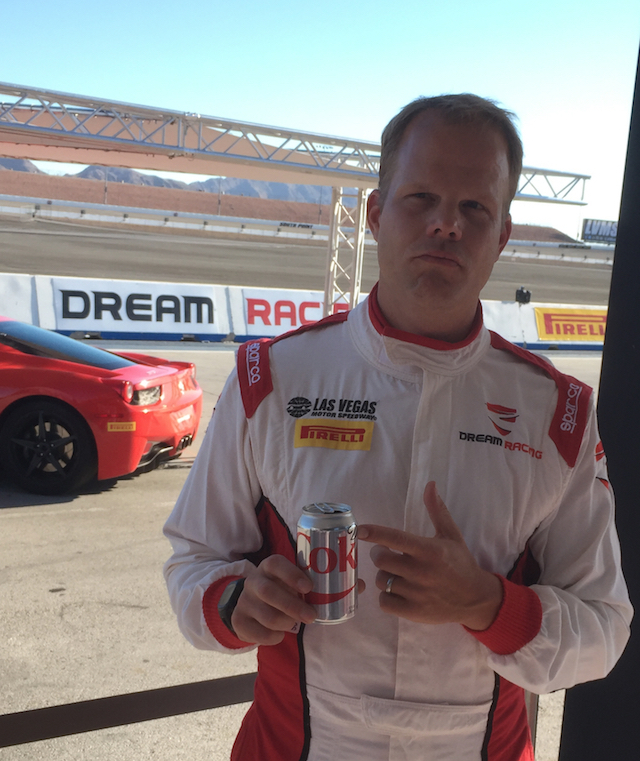 Even when driving Ferrari F-430 race prepped track cars Kibbe can only think about how refreshing a Diet Coke would be. 2. Be characters in the Disney/Pixar movie, Cars 3. Finnegan is the General. Kibbe…is wishing he was the General. FAILED. 3. Syndicate the show onto TV and radio, having awesome guests in studio, with Dale Earnhardt Jr. on regularly to be our best friend. 5. Blow up the podcast so that it becomes a regular weekly show, interviewing celebrities, and actually providing a living for us capable of allowing us to race cars anytime we want plus let our wives get the shoes they like. 6. Get our own studio. 7. We each get a General Lee (real car – not a toy). Kibbe has one! 8. Get a Voiceover Guy to announce the segments. 9. Jump a car together. Kibbe wants to go 30-feet vertical. 11. Kibbe needs a new wallet to replace his “George Costanza”. 12. Mike to get a new truck for legit towing. DONE!